Adam, was born and raised here in Tallahassee. His father and mother have been long time Tallahassee residents. His Father (before his passing) started and operated a local printing company which his siblings and Mother still operate to this day. All of his siblings live here, have their families and children in the Tallahassee community. He met his wife here and his little girl will attend her schooling here. Adam has created 2 flourishing business’s here and employs local workers with their own local families and households. The point to this is that he believes in this community and the people in it. Our company would not search for expansion into further business endeavors if we thought it would negatively affect those people who rely on the company for stability. Upon completion from a local high school Adam attended college for a brief period. However, like many of the titans of industry he found himself better served by getting straight to work. Over 20 years ago he started with a pickup truck and an unbridled desire. Adam realized early that to be successful, you had to have a strong work ethic, integrity, and quality. As the company still abides by these ethos, we regrettably see it less often and more malleable from persons or companies in similar industries or with similar business models. Adam strongly believes this is a key factor in our continued ability to thrive. We now have a fleet of vehicles and a small army of personnel. Some of the accomplishments and associations that Adam has aligned himself with or accrued should hopefully help give you a glimpse of his character and abilities. We are members of the Tallahassee Chamber of Commerce, BNI biznet, and previous member of the Tallahassee Builders Association. We are recommended frequently by the city of Tallahassee for drainage mitigation. We were a recommended contractor for the City of Tallahassee’s Grant Drive drainage project. Adam has been asked to speak at master gardener’s classes and instruct the Tallahassee Board of Realtors to discuss drainage and curb appeal on a regular basis from years back to current day. 1 . How long have you been working for Fielder Tree Service? Since day one of the Tree Service Division. 2. 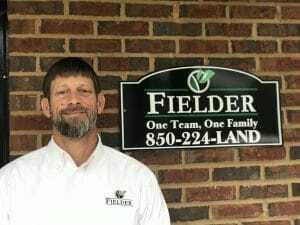 Why did you choose Fielder Tree Service? Adam and I had a vision to create a tree service that prides itself on quality work and outstanding customer service. 3. What do you love most about working for Fielder Tree Service? I love our employees and getting to see at the end of everyday our vision achieved. I enjoy spending time with my family and 2 kids. Jarrod (Boo) Suber was born in Tallahassee, Florida in 1978 and still resides here. Since birth everyone who knows him calls him Boo. Upon graduation from Leon High School he worked for Barnes Healthcare Services where he received countless educational courses in sales, marketing and medical technology. In 1998 he was recruited by his best friend Ricky Carmichael as Transport Manager to drive his private motor coach. He traveled the country with RC Racing until Ricky retired. Ricky would become the number one SuperCross and MotorCross rider of all time. While working the MotorCross circuit he was recruited in 2004 by the world’s largest privately owned distributor of aftermarket accessories in the power sports industry, Parts- Unlimited. He was the Brand Manager for Pro Circuit Racing International/Renthal International. In 2009 he returned to Barnes Healthcare Services as the custom mobility sales manager for the rehabilitation division of the company. In this capacity the sales of this division grew by 50% in the panhandle region. Boo is a current member of the Tallahassee Chamber of Commerce, has been a sponsor of Big Brothers and Sister, and a volunteer in Echo Outreach Ministries. He enjoys spending time with his family, playing golf, and exercising. When Boo is not busy you can find him practicing on his guitar. After working for a large national company for several years, I wanted to work for a local company committed to customer service in the community that I live. I enjoy the people I work for and the people I work with. I love spending time outdoors with my family.  Michael Lindsey is an International Society of Arboriculture Certified Arborist (ISA # SO-05290A) and holds the ISA Tree Risk Assessment Qualification (TRAQ). He is also a Florida Certified Pest Control Operator and holds a Florida Certified Fertilizer Applicator license. These certifications require continuing education units which keep him up to date on current industry research and applications. These trainings have accumulated to over nine hundred hours during the course of his career. Mike began is career in the green industry shortly after completing a 4-year enlistment in the US Navy. After 3 years working for a nursery/landscape company, he entered the tree care field in 2003. Since moving to Tallahassee in 2006, Mike has enjoyed helping the people of Tallahassee improve their landscapes through proactive tree care. Mike is member of the Tallahassee Chamber of Commerce, former member of BNI-TNT and Network of Entrepreneurs and Business Advocates (NEBA – formerly North East Business Association). When not working, Mike enjoys exploring the outdoors with wife Elizabeth and 6 children and volunteering as a basketball coach for Upward Sports. I loved the atmosphere and the work environment. I enjoy working with many different types of people and creating an atmosphere that we all enjoy and feel happy to come to work every day. I love traveling to see my 2 kids and 3 grand kids that live out of state. I also love spending time outdoors. DarcyLi Salinas is the General Manager who works with Fielder Tree Service, she manages the company’s cost elements, revenue and oversees all administrative functions. DarcyLi grew up in Madison County and Jefferson County. As she became an adult, she moved to Wisconsin where she raised her 2 children. Once her children completed college, she moved back to Tallahassee. 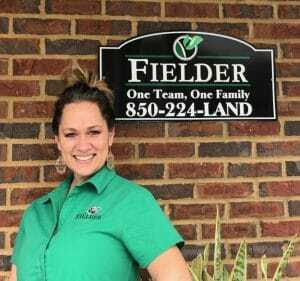 Before joining Fielder Tree Service in early 2018, DarcyLi also worked for Fielder & Associates for 4 years. Fielder has given her a diverse range of opportunities, including customer service, accounting, marketing, and the implementation of our software program to streamline and grow the business. DarcyLi’s extensive background in sales support, customer service, purchasing, accounting and other administrative areas of a fully functioning office has given her the ability to aid in the growth of Fielder Companies. DarcyLi strongly believes in the importance to helping others in their roles at the company, as it builds growth and a strong team atmosphere. The Fielder tag line that we all live by is “One Team, One Family”, and we believe it builds a strong team connection. When DarcyLi is not working, she enjoys the outdoors, spending time with her friends, and traveling to Wisconsin to visit her 2 children and 3 grandchildren.